Heat half the milk over low heat until slightly warm, but not hot (or it will kill the yeast). Crumble yeast in a large bowl. Add warm milk, one tablespoon of the sugar and five tablespoons of the flour. Stir to combine and dissolve. Cover with a tea towel and set aside in a warm place. Let rise until spongy. Add the egg mixture, the remaining milk, the alcohol and orange zest to the yeast mixture and stir until all the ingredients are well combined. Sift the remaining flour into a big bowl, pour in the egg and yeast mix and stir with a spoon until well combined. If the mixture is too dry add more milk, but you shouldn’t need to. Knead dough by hand for at least 20 mins or until smooth and soft. The softer the dough, the more tender the doughnuts. Gradually add the melted butter and continue kneading until the dough incorporates it and is no longer sticky. This seems impossible, but it will all be absorbed and the dough will be become smooth again. Shape dough into a ball, transfer to a large clean bowl, cover with a tea towel and leave in a warm place until doubled in bulk, about one hour. Place half the dough on a lightly floured work surface. Sprinkle lightly with flour and roll to a thickness of ½”. Using a glass or cookie cutter, cut circles approximately three inches in diameter. (You can gather up the scraps of dough and re-roll them.) Spoon about ¾ of a teaspoon of jam filling into the centre of each circle. Raise edges of dough and pinch together firmly, then roll into balls. Make sure the jam is well and truly sealed inside the ball as it has a tendency to leak out later. Note that dough dusted with flour will not stick to itself, so brush off any excess flour before pinching the disks closed. 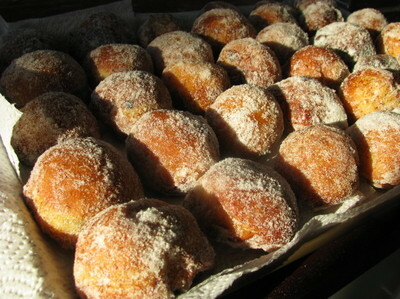 As you shape the doughnuts put them onto parchment lined baking sheets and keep covered with a tea towel. Repeat with all the dough. Let rise in warm place until doubled in size. Heat oil over medium heat in a big, deep pan. Use enough oil so that doughnuts can float freely (about 2½”) but never fill a pan more than 1/3 when deep-frying. (Have ready the pan lid in case of fire.) Test the temperature by frying a small piece of dough; it should bubble and float up immediately. Fry several doughnuts at a time. Cook on each side until golden brown, about two-three mins per side. Lift out with a slotted spoon to drain on paper towels. While warm, toss with caster sugar to coat. Eat soon! These doughnuts are heavenly warm from the fryer, delicious later that day, a bit dry the next day, and approaching cardboard by the day after that.